The company has an amazing app which will soon be able to take users on a tour of several marquee museums with some of the best collections of art and artifacts in the world. 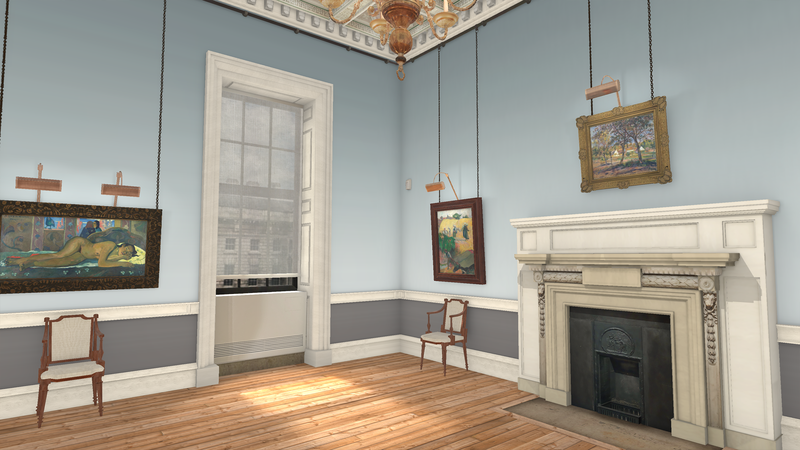 For its first offering, the company is offering users who download the app a free view into one of the most famous rooms in the Courtauld Gallery, a gallery housing one of London’s most famous art collections. The gallery, on a bend North of the Thames near the Waterloo Bridge, holds a treasure trove of Impressionist and Post-Impressionist masterpieces including works by Gauguin, Renoir, Manet, and Monet. Through the first offering on the app, users get a voice guided tour of the room’s paintings narrated by the author Neil Gaiman (a Woofbert investor). The idea for Woofbert came to the company’s co-founder and chief executive, Robert Hamwee, after a failed visit with his family to the National Gallery in Washington over an Easter vacation two-and-a-half years ago. Quelling a revolt among his two kids who’d been waiting on line at the museum on a chilly Easter afternoon by canceling the trip, Hamwee wondered whether virtual reality might hold a solution to his aesthetic problem. The co-founder of the company had been reading Ready Player One and was interested in the opportunity virtual reality might present for art education and appreciation… and opening access to the world’s greatest museums for people who may never otherwise see these treasures of the art world. Through connections Hamwee met Elizabeth L. Reede, the company’s co-founder and chief operating officer who previously worked as an assistant curator at the Museum of Modern Art in New York. Over the course of 2014 the two began reaching out to contacts in both the art world and in the virtual reality development space. Reede contacted her friends and associates at auction houses like Sotheby’s, museums including the Barnes Foundation, the Metropolitan Museum of Art, the Tate, the Smithsonian, and the National Gallery. While all of these institutions have the desire to bring their collections into virtual reality, they lack the operating budget and staff to make it happen, Hamwee said. In those early days Reede was hauling an early black-box version of the Oculus from its first dev kit around to museums and meeting rooms around the world… and drawing the attention of airport security everywhere she went. From an early in-house prototype that was developed with consultant providers, Reede and Hamwee reached out to Samsung and Facebook to see if they could take the project to the next level. The two virtual reality pioneers introduced the company to the team at Reload Studios in Los Angeles. Using their virtual reality development lab (dubbed Rascal) Hamwee and Reede were able to further refine their technology platform while offering Reload chief executive James Chung an entry into the museum and fine art world, according to the two founders. 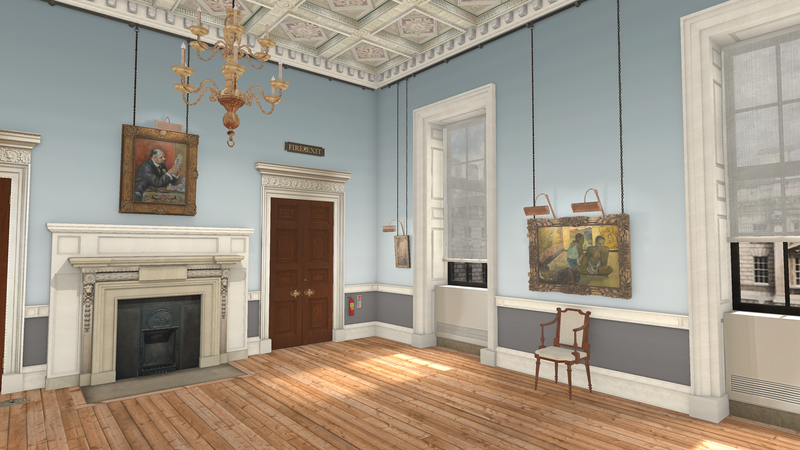 The team envisions working with other players in the virtual reality space like Altspace or DiscoverVR to eventually bring docents into this virtual environment in real-time to offer tutorials on museum collections. 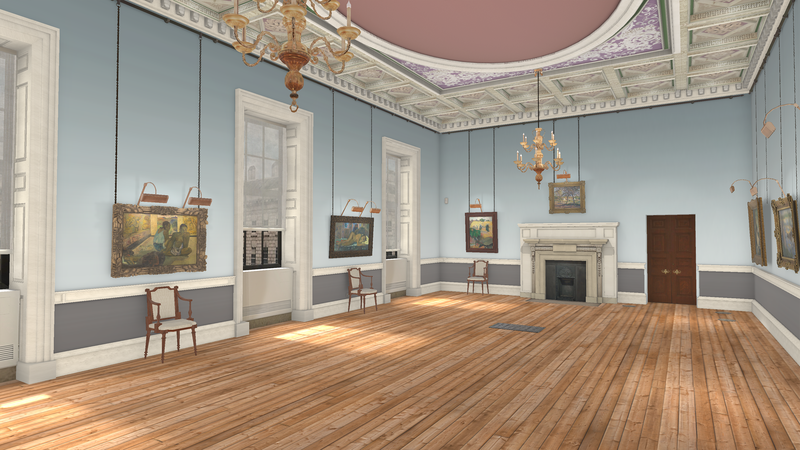 So far, the company is only offering up the Wolfson Room in the Courtauld Gallery for a viewer’s pleasure, but Reede says that new content will go up on the site every four-to-six weeks and that the company is already in talks with some 85 museums and gallery spaces to bring their collections into virtual reality. Hamwee has put up much of his own wealth to finance the company, but Woofbert did raise an additional seed round of $3 million from friends and family (like Gaiman and Academy- and Golden Globe award winner Kevin Spacey). Eventually, Hamwee and Reede envision Woofbert generating revenue from a number of different avenues. There could be in-app purchases of art, guided tours that users pay for, and perhaps even a marketplace for the sale of virtual reality pieces by new artists. Spacey, the largest shareholder in Woofbert outside of the company’s management team, also serves as a creative advisor. The company’s value proposition is more than just guided gallery tours. Woofbert is developing a full suite of educational products that it will offer to schools and to casual users who want to learn more about the world’s great works of art. “We’re developing the monetization platform now and we’re going to check when that makes sense to flick on,” says Reede. Beyond money, there’s a whole range of new features that Woofbert wants to provide to users, including an ability to enter into paintings and view their world from inside the canvas (I compared the feature to the scene in Akira Kurosawa’s Dreams where he enters a series of Van Gogh paintings).